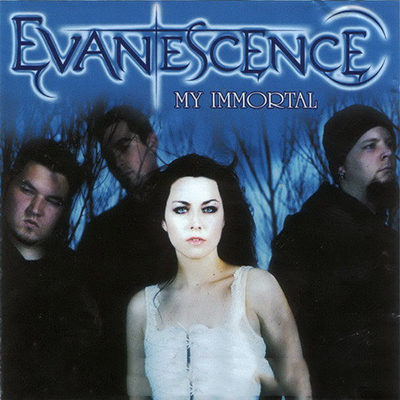 "My Immortal" is the third single off American rock band Evanescence's first studio album Fallen. It was written by guitarist Ben Moody except for the bridge. The song "My Immortal" is a piano power ballad written in slow tempo. Lyrically, it talks about "a spirit staying with you after its death and haunting you until you actually wish that the spirit were gone because it won't leave you alone." The song was also commercially successful, peaking within the top ten in more than ten countries. It also peaked at number seven on the Billboard Hot 100 and topped the charts in Canada, Greece and the US Adult Pop Songs chart. The single was certified gold in the United States, and platinum in Australia.